I have always been an antisocial and socially retarded but it helps that I have a job that requires social interactions and it's also great that I do have friends and family and I am not totally alone. "No man is an island," this is what my grade school teacher has always told me because during grade school I was the only guy in a 5-student class. It sucked that all my classmates were girls and they used to play these girly games and they wouldn't let me play. They would only let me play with them if I became "Ciara" and become one of them. Tsk tsk tsk... but I still love Del Monte School and my 4 female classmates. Imagine, we 5 were the only ones who graduated! Isn't that something? Anyway, I did enjoy Judy's birthday party. 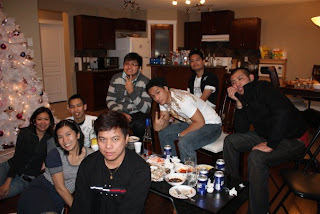 I was able to catch up with old co-workers and we were talking about the good old days, ranting about work and people that pisses us off or people who used to piss us of. It's always good to break out from your daily routine and start feeling like a human again. Judy's party was a blast. 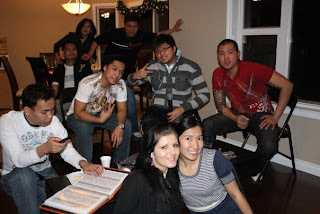 As usual, as any Filipino household would have, our main form of entertainment was the karaoke. Don't get me wrong, I love the karaoke even if I'm not that good at it. I've actually ordered one for myself just recently (damn my impulsive buying habits), well it's a gift for my mom and dad so it's worth it. I have to thank Tyler for letting me go home earlier. Although I didn't get laid (I think he was thinking of another kind of party LOL) I still had fun. It was also great to see Elvira by the way. Speaking of Elvira, if you want to get a haircut go see her at Kaya Loma Salon and Spa. It was funny the way Elvira suddenly said "Go Bosnia! Go Bosnia!" when we were singing the lines of the song Bebot. I wish that more people would have come but it was sort of a last minute thing and the other people had work. But I'm looking forward to more parties this coming days.